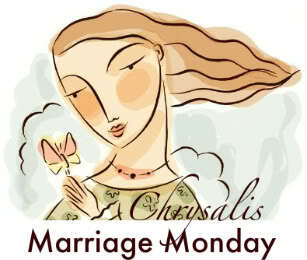 It’s Marriage Monday at Chrysalis, and today’s topic is “Romantic Food Faves”. You don’t have to go a long way to keep the romance in your marriage – in fact the most romantic picnic my husband and I ever had was in our own backyard. One balmy August night last year my husband and I found ourselves on our own for the evening. My husband fancied barbecuing, and as I had some steaks from our marvellous local butcher this seemed like a very good idea indeed. Now, some folks might not consider a barbecue a picnic, but when you light some candles round the patio and on the table, and make your surroundings really beautiful, I don’t think the lack of a picnic basket and a blanket disqualifies you from calling it a picnic – at least I hope not! The wonderful thing about this picnic was that we prepared the meal together. Most times our picnics are rather more formally organized affairs, generally away from home at some sort of an event like a play or concert, and I do most of the shopping and preparation. Then there are tables and chairs to be put into cars, things to remember and usually, things to forget! This picnic was easy, totally spur of the moment, and working together made it even more fun (especially for me!). Don’t get me wrong, there is nothing I enjoy more than preparing a romantic meal for my husband. It’s like giving him a gift. But sometimes the very act of working together can be romance in itself. Plus it is also really rewarding to know that you have each done something for the other. And as the whole thing didn’t take any more than half an hour to put together, we got to spend the majority of the time enjoying the food and each other’s company. The wonderful thing about steak is that it really does not need very much to accompany it - fluffy baked potatoes, a crisp salad and something delicious to drink. For us that is a glass of good red wine, but it could be anything from champagne to sparkling apple juice. So while I gave the baked potatoes a head start in the microwave, my husband fired up the grill, and then as he took the potatoes out to the barbecue, I threw together an easy green salad with some heirloom tomatoes as a garnish. Once the grill was hot it only took about ten minutes to cook the steaks. Before we knew it we were sitting in the twilight, enjoying a wonderful meal and talking like we had not had a chance to in ages. My husband has a very demanding job, and often works from home in the evenings as well as at the office during the day, so this evening – a little oasis of time in the midst of all the busy-ness - was an absolute gift. We shared some fresh strawberries for dessert, and as the night drew in we cuddled up together and watched as tiny bats swooped across our property in the moonlight. The crickets were chirping and it seemed like I could see a million stars. I’ll remember it forever. In fact, I dearly hope we can repeat the experience again this year, and if you and your husband find yourselves on your own one evening anytime soon, I highly recommend a backyard picnic as an easy and inexpensive way to have a beautiful, memorable evening together. Beautiful. I think I will try a backyard picnic with my husband. And, I am going to barbeque!